Simon Thomas has revealed he is in 'the early stages' of a new relationship, a year after the death of his wife, Gemma, to cancer when she was just aged 40. 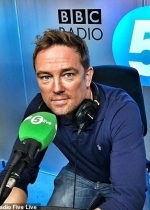 Speaking to BBC Radio 5 Live, the ex sports presenter, 45, who moved millions with his heartbreaking comments in the wake of his wife's death, said his new relationship has been 'an incredible support' for him. The father-of-one admitted he could be falling in love, but said Gemma could never be replaced, saying: 'I’m very aware she was someone I didn’t know before and have got to know over the last few weeks and months.